APPEARING FLUORESCENT LIGHT BULB - HALF PRICE SALE! 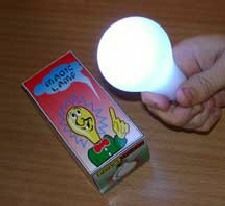 You produce a full size FLUORESCENT LIGHT BULB from places impossible to hold a bulb this size! That's right! 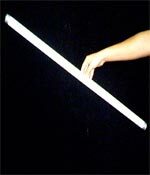 Imagine producing a three foot long FLUORESCENT LIGHT BULB from your pocket, a hat, square circle, bag, small briefcase, lady’s pocketbook or anything that could not possibly contain it! This has real SHOCK VALUE! You'll think of many funny uses for THIS! Easy to do. Reuse over and over. Buy several and produce them during your act - or ALL right after each other!